“Its better when they come earlier in the pregnancy, around 5-6 months, then we have a good amount of time to help prepare them for the birth and also talk to them about what they want to do after the baby comes”, Sister Louise says, in reference to the Mother and Baby Home, “..but more often than not, the girls come at the last moment, when they have no-where else to go and the baby is almost due”. As I talk with Sister Louise, Thai staff quietly knock with small requests, her mobile phone rings, followed by a group of professors from one of the city’s most prestigious Universities here to investigate an outbreak of Dengue Fever that has left eight of the teenage residents in hospital. Criss-crossing between fluent Thai, French and then back to English, Sister Louise deals with each one calmly, patiently and a razor sharp focus. My greatest concern after meeting Sister Louise is if I can I do her story justice – in a blog. The breadth of her life experiences is so remarkable and humbling – though she seems oblivious to all that she has seen and done over her many years of service. 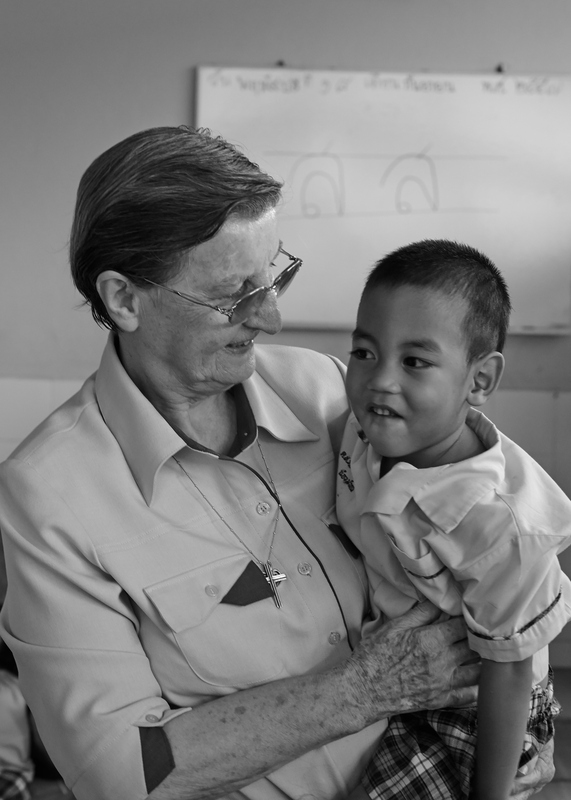 From assisting thousands of young Thai women flee exploitation and violence – to burying up to 50 corpses a day at the Thai-Cambodian border during Pol Pots reign of terror, Sister Louise has seen life at its most challenging and desperate. Yet she has also done so willingly and in accordance with her vows. “When I left Ireland, it was like a funeral. In those days, once you left to join the order and work overseas, you had to dedicate your life to it and you were not allowed to see your family again. When I came to Thailand the understanding was that this was where I would stay and work for the rest of my life. But you never questioned these things, it was all part of it and it was what I wanted to do. I was very excited”. When Sister Louise arrived in Bangkok, one of 3 Nuns and the only passengers on a cargo ship from Sri Lanka, she had just £10 in her pocket. The year was 1965, and Bangkok was awash with GI’s, young pregnant girls and widespread poverty. From scratch, Sister Louise and two other Nuns started their work – first setting up in a small house and then later, acquiring abandoned swamp land at Din Daeng and slowly building what is now their current premises. Even today, Sister Louise starts each day at 5.30am and works through til 5 or 6pm, 6 days a week. Her energy is tireless, though she admits with a wry smile that her “knees aren’t what they used to be”. Working with Sister Louise in Bangkok are 5 younger (Thai) Nun’s who each have one of the projects they oversee. They too are a dedicated and resolute in their efforts. As Sister Louise notes, social work very rarely fits neatly into office hours. In a country that is predominately Buddhist, Sister Louise says it is the Buddhist faith and Thai’s dedication to it, that has been her biggest blessing. “The Buddhist notion of Merit has helped us enormously; that is that if you do good in this life and give to others then you will be better off in the next. When we first started out, local people and even monks would come by each morning and leave food on our doorstep as an act of merit. It gave us enough to feed those in our care, and then over time, people would be generous and giving in other ways”. There’s a lovely circle of faith here that just seems to work. For Sister Louise her motivation has never been to convert people or impose her own beliefs but simply to be of service to others and to dedicate her life in the most selfless and profound of ways. Over in the Mother and Baby Home, pregnant young women sit under fans quietly chatting. One is feeling the onset of contractions and will likely deliver today. She is nervous and excited; … this is her first child. On the opposite side of the room a young mother cradles her newborn and stares at him adoringly, as if the world beyond these walls simply doesn’t exist. I’m told that I can’t take photos here as secrecy is paramount. Most of the girls have either been shunned by their families or are escaping a volatile relationship and in many cases it it is both. What the Home offers then is not just a place to support and assist, but a safe haven where young women can take the time they need to work out the next important chapter of their lives. At the Child Care centre there’s a cacophony of chatter and laughter amongst the three and four year olds, as two carers prepare for them a nutritious chicken soup for lunch. In the rooms above, refugee kids from places like Syria and Pakistan learn the basics of Thai language, a prerequisite if they are to gain entry into any government Thai school. On the opposite side of the compound, teenage Thai girls, mostly from remote and rural areas, learn basic sewing skills while over in the Handicraft Centre, there is a hive of activity as 120-odd women cut bolts of fabric, whir away on sewing machines and carefully put the finishing touches on a large order of Christmas decorations and toys which will be on sale at an upcoming fair. What strikes me most, after meeting Sister Louise, is that it’s not just kindness and charity that gets the job done. Not by a long shot. It’s the wherewithal and determination and sheer willpower it must take to put a roof over peoples heads year in-year out, to feed them, to make sure the bills are paid, to administer staff and volunteers, to fund-raise and to keep track of it all. It’s an enormous task and you have to keep reminding yourself – this lady is 80-years-old! Later this year, Sister Louise will step aside from her current Administration position at the Good Shepard Home, to move into a more pastoral role with the residents and volunteers. “We never really retire”, she says, her eyes twinkling, “ours is a lifetime commitment which I think is just great”. There’s no doubt that Sister Louise not only means this, she lives it and breathes it – her dedication to those less fortunate such an intricate part of her being. And Bangkok is, without doubt, all the better for it. What’s your first memory of Bangkok? I came to Bangkok from Sri Lanka with two other Nuns and the journey, which was on a cargo ship with no other passengers, was just terrible. The conditions were very poor and we were very seasick and lonely the whole time. We had just a little suitcase each and we knew when we arrived we would have to start work straight away and all by ourselves with no language or resources. But, when we finally sailed down into Chao Praya River, we were greeted by the most magnificent sunset. I thought I had never seen anything more beautiful in my whole life and I will never forget it. I knew then that everything would be okay and that this was where we were meant to be. What is the greatest challenge of your work? One of the greatest challenges is to continually raise funds to do the work we need to do. Some of the younger Nuns worry – but I say, don’t worry, the money will come – but really, I can lay awake at night worrying about it because after all, someone has to! The best part is providing opportunities for young women – either through work and training or supporting them through difficult times. It’s a wonderful thing to be able to empower and educate young women, to show them love and teach them self-respect. Love, when given freely, has no limit. I believe love can cure everything. This is such an incredibly moving and inspiring story. Beautifully told. Sister Louise told me about her story of leaving home, living and leaving India, and starting in Thailand. It is a very powerful story. Thank you for making this post and sharing.